What about the UPDF? Is a question that officials of the International Criminal Court (ICC) have been asked endless times during outreaches in northern Uganda. In response, ICC officials have for years had a near- standard response: We don’t have evidence to warrant issuing arrests warrants for elements within the UPDF. To many in northern Uganda, as they say, it takes two to tango. The vicious two-decade war in the region which displaced close to two million people and led to the death of countless others in the filthy so-called Internally Displaced Camps was fought between the Ugandan government and the murderous Lords Resistance Army (LRA) rebels. Direct conflict on northern Uganda soils between the Uganda army and the LRA ended about 2006 and by 2007, the displaced had began going back to what remained of what was once their homes to start a new life from the ruins. More than a decade later, the effects of that conflict still lingers. The chief protagonists in the war have since moved on. Joseph Kony and his LRA are reportedly peddlers of ivory between lawless eastern Congo and the Kafia Kingi enclave in Sudan. The UPDF, also moved on to more adventurous missions in the Democratic Republic of the Congo, Central Africa Republic, South Sudan and Somalia. Uganda’s long ruler and UPDF commander-in- chief President Museveni likes to view his army using Pan Africanist lenses; African solutions for African problems, so goes the mantra. To Museveni, a strong roaming army is an essential part of his version of his Pan Africanism. To his credit, the UPDF, compared to the armies of previous governments in Uganda, is more respected nationally and regionally. It is the defacto swift force of the region; it can be deployed solely by Museveni without the democratic encumbrances of having to consult a parliament, a thing which makes him[Museveni] a key cog for ‘‘internationalist’’ interests in the Great Lakes region. But as the UPDF scores victories, the northern Uganda monkey is still on its back manifesting itself through the seemingly innocent but persistent question: what about the UPDF? 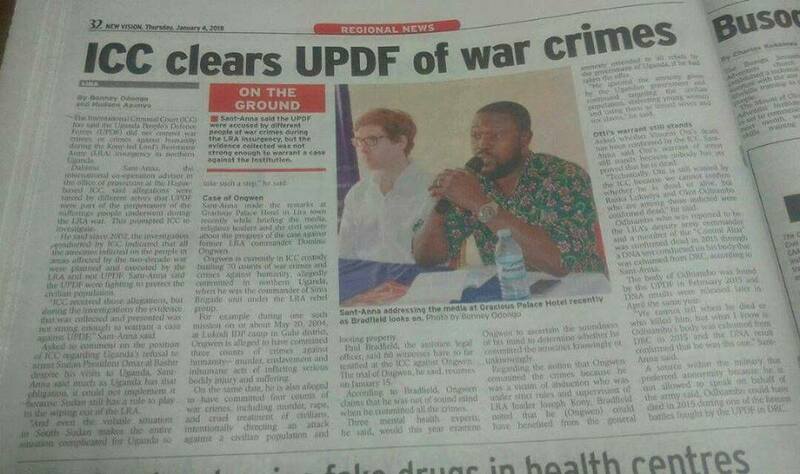 ‘‘ICC clears UPDF’’ screamed a New Vision headline last week. The New Vision is publicly listed but the Ugandan government has majority shares. In his New Year address, President Museveni blasted the paper’s CEO Robert Kabushenga for ‘‘using the platform given to him by government’’ to ‘‘specialise in writing trivialities. The screaming New Vision headline was soon scanned by the heads that manage the UPDF’s image, uploaded online, shared on Facebook, tweeted and re-tweeted on Twitter. ‘‘The UPDF has always protected the population and fought for the national interested,’’ crooned Major General Muhoozi Kainerugaba, the president’s son, on Twitter. Major General Muhoozi who some accuse of rising through the army at rocket speed is his father’s ‘‘Senior Presidential Advisor on Special Operations’’ (in Uganda that can mean anything). The tweeting will be interpreted as one of the many past and present attempts to remove the ugly northern Uganda monkey still clinging on the UPDF’s back. 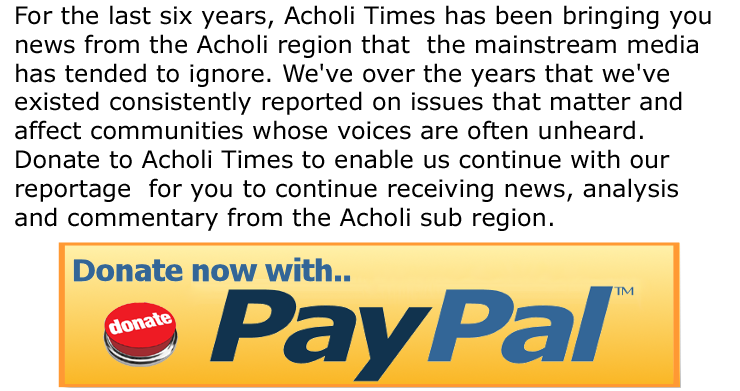 But like anything online, social media users began to question the veracity of the New Vision reporting. ‘‘I doubt the ICC said this,’’ tweeted journalist Evelyn Lirri. By stating that there is no evidence to warrant an arrest warrant for members of the UPDF, it does not mean the UPDF has been cleared of allegations of war crimes by the ICC. Cognisant of the persistent ‘‘what about the UPDF’’ question, in 2017, the ICC shared with the public a hotline for communities in northern Uganda to share evidence of crimes committed in northern Uganda, by among others the UPDF. Not many have come forward to volunteer information. There is a probability that if ever the ICC gets information it considers sufficient to investigate the UPDF, it will do so. But even if the ICC had the evidence it needed to investigate the UPDF, it is unlikely the court would go full-throttle on individuals in the Ugandan army now. The court needs Uganda’s continued cooperation on the arrest warrants on the LRA commanders. More so, the ‘‘Uganda case’’ remains significant if not for symbolic value for the ICC having been the first to be referred to the court. Museveni too needs the ICC which is why he rants against the court but keeps being a signatory to the Rome Statute which created the court. For the UPDF, it’s not yet time to celebrate freedom from the monkey on the back.